Today, a very special treat for you all. 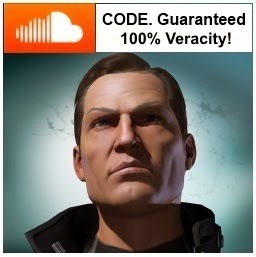 Agent Sasha Nyemtsov is widely held to be one of EVE's foremost scholars of the Code. 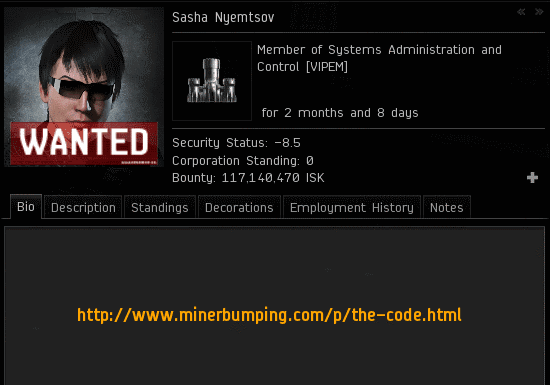 A week ago, Sasha commented on a MinerBumping post with some words of wisdom about the first sentence of the Code. After savoring the second sentence of the Code (seen below), Sasha was inspired to go even further. "As Saviour of Highsec, I am the leader of the civilizing forces." Sasha uploaded a recording of a six-minute homily he delivered about the nature of the Code and its leader--yours truly. This is a recording you won't want to miss. Sasha's impressive speaking voice is surpassed only by his eloquence and insight. Listen and re-listen. If you're reading this blog at work and don't feel comfortable playing a recording, cast those fears aside and invite your coworkers to listen. Though most recordings linked on this website are intended for the ears of our supporters, I feel this particular one would prove beneficial for the rebels and bot-aspirants. I encourage everyone to link it generously in local and in the EVEmails sent to gank recipients. Some people are better at learning by hearing, rather than reading, so Sasha's voice may reach previously unreceptive carebears. So amazing. High quality work, totally made my day. WELL DONE fellow agent! This is probably the most amazing recording I've ever heard. It almost had me fall asleep! To bad.. I'm looking for a sleeping aid at the moment. It realy needs Klaus picture to make this post complete. Klaus looks very much than a lowly sycophant and RL loser. He is a most typical code monkey: To afraid to go to nullsec, hiding behind a group of loosers. Even at his first gank he got so nervous, he botched it and that when no one is shooting back. I would expect a German to be more critical and less afine to Propaganda since he should have learned that from "damals". Have you ever solo ganked anyone in your eve career? You don't really "do" parody or other forms of humor very well, do you? a) no i didn't don't solo gank, i dont shoot cows with big guns. but i do lowsec solo pvp. question what mníght be more exciting? b) i am quite fond of humor, had some lols when i made fun about you guys in local. Considering fun, i might have more fun at parties since my jokes are more sophisticated and whats most im portant: they are realy funny as in opposite to stupid, as in stupid and ridiculous jokes. Sooooo... You shoot cows with small guns? I guess everyone needs to get their thrills somehow. b) Of course i will not shoot at cows with small guns, since i find shooting cows in highsec boring. Do have an idea how lame *this* "joke" is? I talked to a non Eve person in a pub earlier today and I explained what it was all about. He used many words and sentences. This means, listening and responding. If you're playing an Online game there will come a time, sooner rather than later, where you will have to do the above. Regardless of language barriers. It's a benefit if you make the effort to understand and persuade. Both parties can do both, if you keep the language civil and non-hostile both parties will be better off and I am certain strong bonds of friendship and understanding will emerge from the encounter.